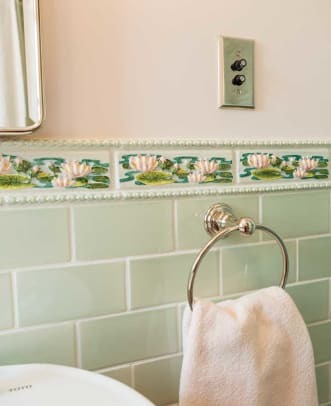 Watery motifs in the embossed tile set the mood in a playful yet spare new bathroom for a 1930 bungalow. 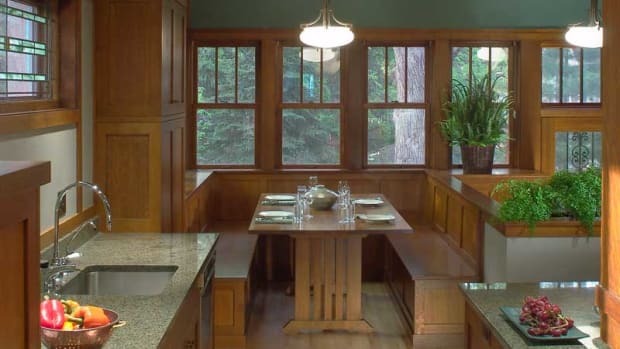 The biggest project in this house restoration was the kitchen, which had lost all its original details. The indomitable homeowner, Roseann Ferrini, tackled the bathroom next. The 1,200-square-foot bungalow has just one bath, so the room had to be efficient. At the same time, Roseann was able to splurge somewhat—on tile. 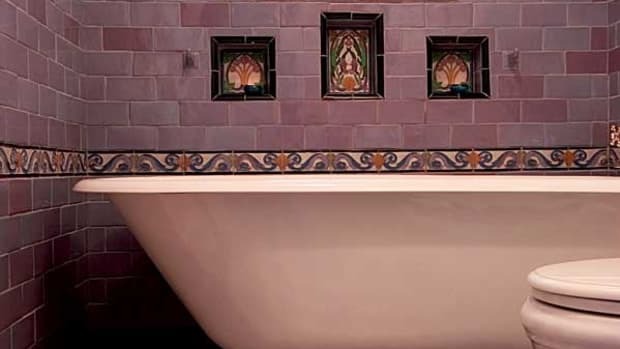 The arched niche surrounding the bathtub is a Jazz Age feature. 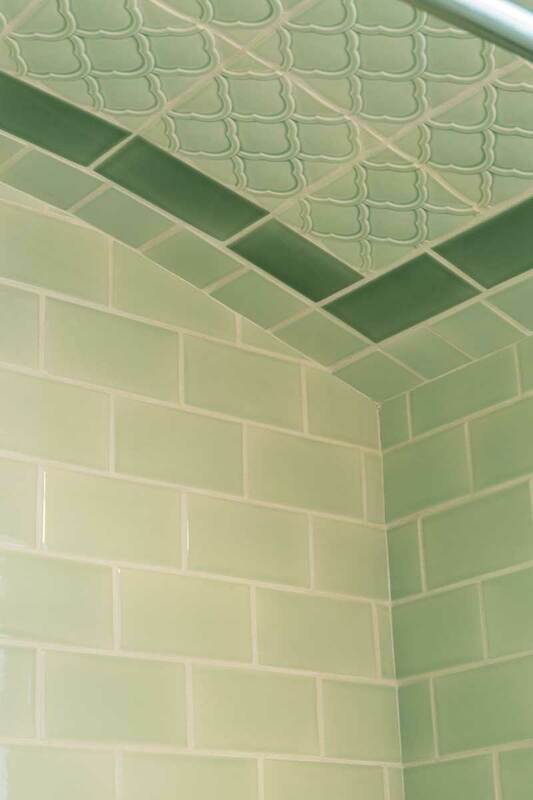 Minty subway tile is enhanced with a darker border and vaguely Moorish embossed tiles in the ceiling. 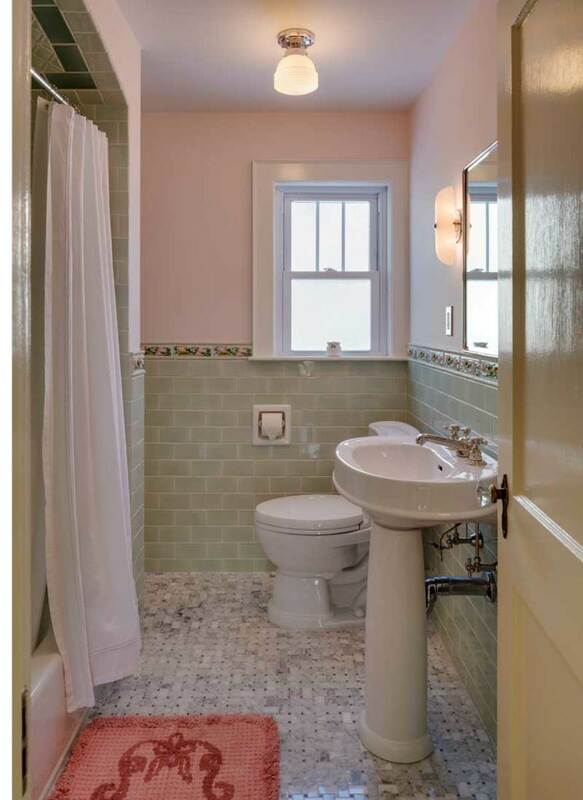 “It’s all about the tilework in these old bathrooms,” Roseann says. “That’s what makes them so amazing.” She began by searching for the perfect decorative relief tiles, used here as the wainscot cap. When she found the water lilies, Roseann had her vision. “I liked a water theme for a bathroom,” she explains. 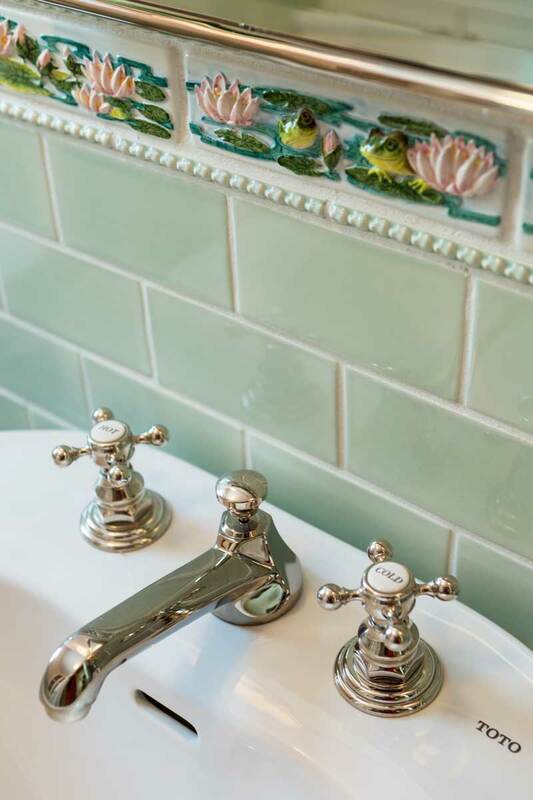 Over the pedestal sink, one relief tile depicting storybook frogs adds just a touch of whimsy. 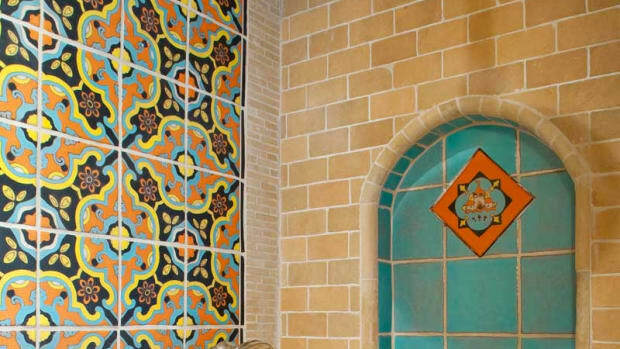 Despite its fanciful colors and tile motifs, the three-piece bathroom is straightforward in the manner of bathrooms typical of the 1920s and ’30s. For the floor, “I knew I wanted small mosaics,” she says, “and I liked the soft gray tones of this herringbone pattern. It’s Carrara marble.” Roseann insisted on the curved ceiling in the bathtub nook, a tribute to 1930s bathroom style. The nook ceiling is embellished with a darker stripe and relief tiles that have a vaguely Moorish design—“I was influenced by a tin ceiling pattern, actually,” Roseann says. 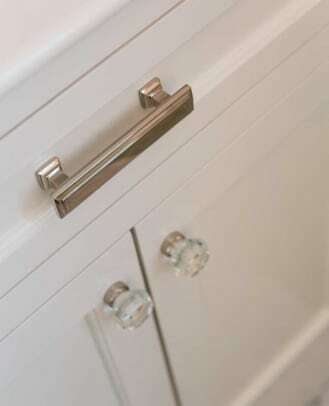 Jane Powell’s book Bungalow Bathrooms, which advocates using white fixtures, hard sanitary surfaces, and nickel fittings, was Roseann’s primary guide for the design. 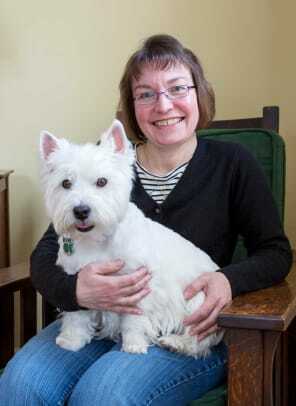 Owing to her use of antique and vintage items, too, the room feels as though it’s original to the house. The Art Deco sconces around the mirror and the overhead light fixture are refurbished antiques. The room is small, just 6&apos;8" x 7&apos;8" after the renovation. A good layout allowed room for installation of a 60" bathtub and a floor-to-ceiling linen cabinet (behind the tub niche and across from the toilet). Textured glass in the cabinet blurs its contents without blocking off that corner of the room. Before, a closet in the bedroom gobbled a chunk out of the corner of the bathroom it adjoined. By moving the bedroom closet a few feet down the wall, this minor renovation “squared up” the bathroom to its full dimensions. The owner also closed off a door that had opened directly between the bedroom and the bath, giving her a continuous wall and more usable space in each room. The bedroom has the same kind of old-fashioned charm as the bathroom with its frogs and water lilies. The antique Gustav Stickley bed wears a vintage chenille bedspread with a border of colorful flowers. The rosy wall color relates to the bathroom’s pink. With antique furniture and its pretty, embroidered table scarves, the bedroom is a throwback to an earlier time.